Vulturic Eye is, straight up, one of the best heavy metal band names that I have heard in a good long while. Toss in the fact that they actually pay some pretty excellent music and you have yourself with something of a recipe for success. there is a thrilling and dynamic magic to their latest EP Crucifixion Of Hope a masterful three track effort that in terms of sheer talent stands a head above many of its peers in the scene. While this new wave of traditional heavy metal thing is rich in bands, it's rare to find one who deliver on the level of Vulturic Eye. The influences here are obvious, bands like Judas Priest and Iron Maiden clearly had a huge impact, as did, in my opinion at least Angel Witch and perhaps even Diamond Head. 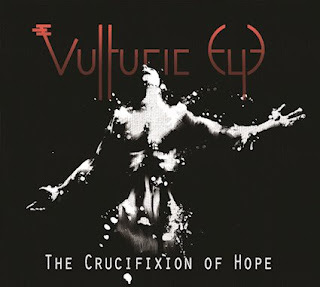 Vulturic Eye use Crucifixion Of Hope to distill down these influences to get something really fun and powerful. That all being said, Crucifixion Of Hope certainly is lacking in a few key areas. Most notably the guitar tone is really not where it needs to be. It is nowhere near sharp enough and is just the most grievous error in what is some fairly weak overall production. Tied into this, some of the songs are a bit too long, and though the ideas are good, I think they might be better shrunk down a bit. What I'm trying to say is that there is no reason for a weird bass bridge in your releases first track. Still, initial errors aside, I gotta say that I deeply enjoy the work of Vulturic Eye on Crucifixion Of Hope. The initial awkwardness is in many ways a part of the appeal, at times almost reminiscent of groups like Angel Witch or even early Tygers of Pan Tang. The band is clearly loaded with talent and watching them tighten their songs down and shift away from a lot of the more traditional rock tropes is going to help. What they do well they are great at and I think the deeper they delve the more inspiring this journey will become.